Don’t Get Bored – Get Active and Grab a Stand Up Paddle Board!! Are you looking for a bit more action in your surface intervals? Are you bringing the kids with you and want to get them active and have some fun? Are you looking for another way to enjoy the beautiful waters of Sulawesi? Then get ready for Stand Up Paddle Board – SUP! SUP is an acronym for Stand Up Paddle board and this is the latest craze that is taking Asia by storm! Stand Up Paddle boards are much larger than traditional surf boards which gives them a higher level of stability in the water – this means that balancing on them is easy and learning is a quick process – most people are up on their feet within minutes! A well as the board you are equipped with a double ended paddle which you use in the same way a kayaker uses a paddle – to turn, stop and go! There are three main ways to approach Stand Up Paddle Board – SUP. You can sit on the board “kayak style” with your knees bent and feet out in front of you – just as you would in a kayak – this is one of the easiest ways to get around on the board as you do not need to stand – it is also a great way of working out your arm muscles and torso! You can also kneel on the board – with your knees on the board and feet out behind – this gives you more elevation than sitting and is a real workout for the muscles down the front of your thighs! Finally, of course, you can stand! And everyone can – this is not like surfing where is takes ours of practice to get 20 seconds of standing – it is much, much easier. Remember to keep both feet in the middle of the board – toes pointing forward and look up towards where you are going, not down at your feet! Before you know it you will be paddling along the Sulawesi coastlines like a pro! So – Are you ready to sign up for some fun! 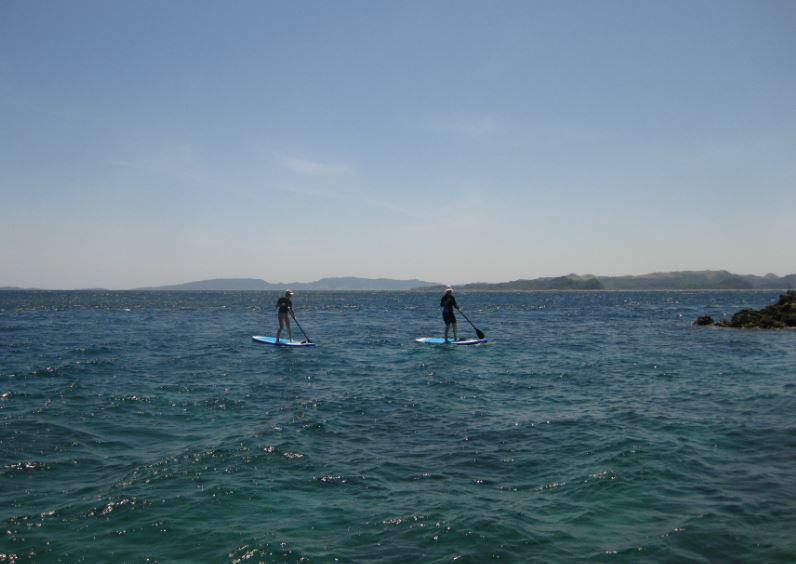 We have Stand Up Paddle Board available in both Manado and Bangka and we can load them up on the dive boat ready for you during your surface interval OR we can send you off on a private snorkelling and paddle boarding day out on your own boat – this is a perfect day out for families and for non-diving groups. If you just want to try Stand Up Paddle Board it is also possible just to rent the boards for a few hours and take them in the ocean directly in front of the resort. Both the Manado and Bangka House Reefs are great for Stand Up Paddle Board – SUP and if you don’t feel like paddling you can always just sit and look down at the myriad of reef fish swimming under your board!